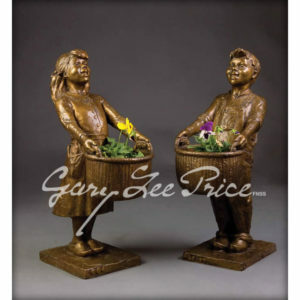 Much of my work is characterized by figures of children enraptured in the joys of childhood. 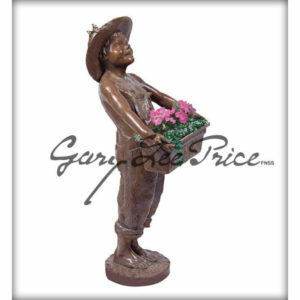 Every once in a while it’s a fun challenge to ‘break the mold’, so to speak, on traditional figure sculpture and create a piece of pure whimsy. A few years ago I created such a piece titled the Puffed Up Prince- a spherical frog, boasting a regal crown, to delight you and your guests. He always seemed to be a bit lonely, so I decided to create for him a companion to share his love and his life with and to bring happiness and joy to your life as well. 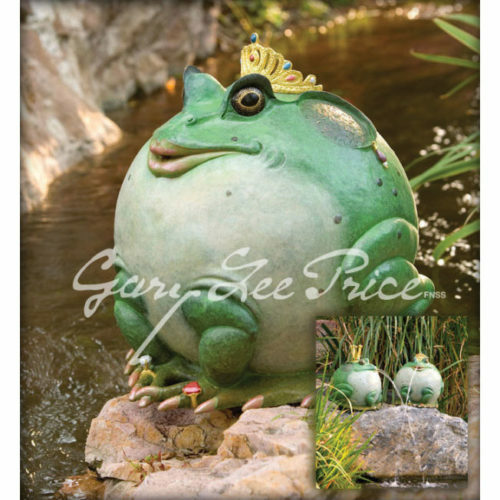 My Puffed Up Princess is adorned with a royal crown, lavish rings, bracelets, and earrings, and boasts the most beautiful set of ‘frog lips’ you will ever see. Alone, or with her Prince, she brings a touch of royal opulence to her surroundings. I offer to you my enchantress, the Puffed Up Princess, for your home and garden and for your absolute enjoyment.